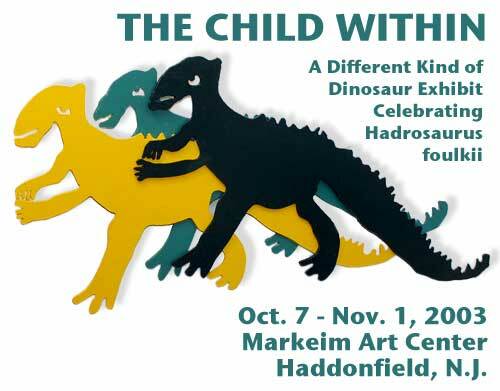 HADDONFIELD, N.J. -- The week leading up to the unveiling of Haddonfield's Hadrosaurus foulkii sculpture kicked off with a dinosaur-themed art show at the Markeim Art Center Saturday night. (larger photo). 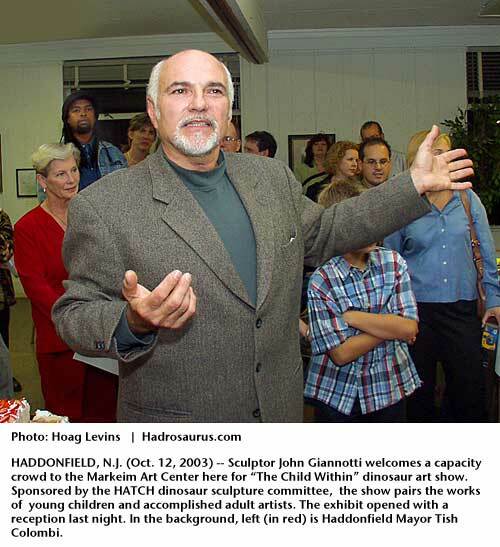 Organized by sculptor John Giannotti, "The Child Within" exhibit features interpretations by accomplished adult artists of dinosaur drawings by Haddonfield school children. Giannotti (above, right) welcomed a capacity crowd to the artists' reception (larger photo). Running until Nov. 1, the show offers an intriguing mix of innocence and sophistication. 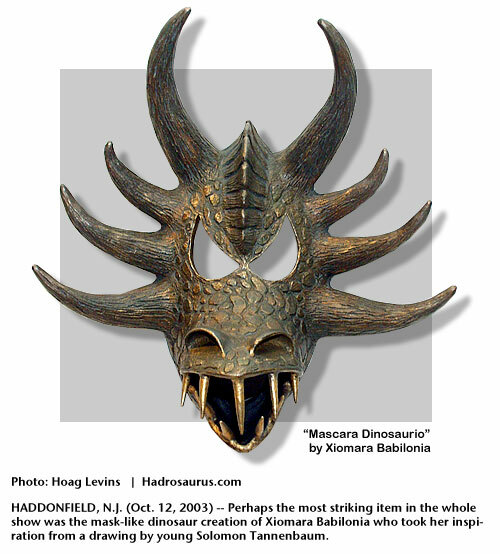 The single most striking work is the mask-like dinosaur sculpture (above, left) by Xiomara Babilonia inspired by the student art work of Solomon Tannenbaum (larger photo). Many of the artists -- young and old -- appeared with their works at Saturday's reception. 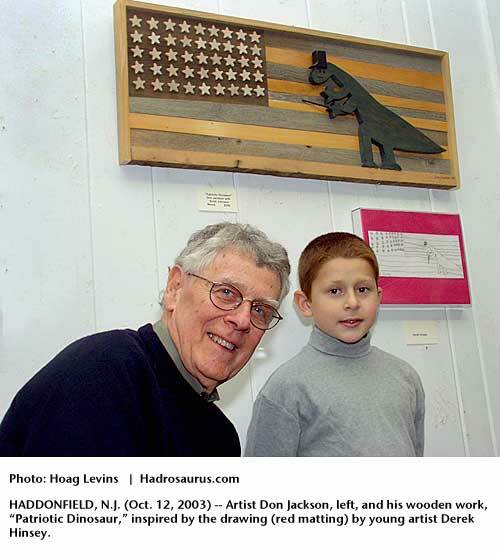 Don Jackson executed a wooden interpretation of a drawing by young Derek Hinsey (above, right) (larger photo). 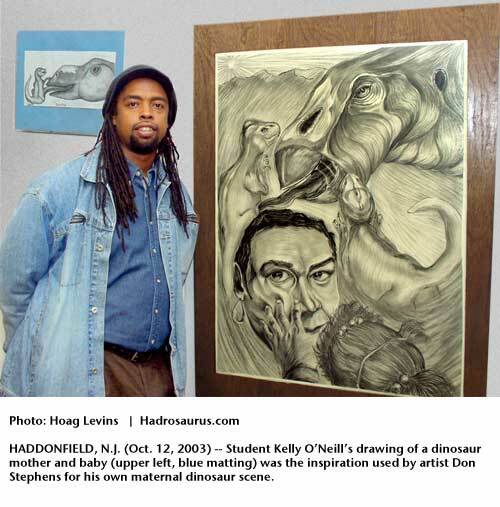 Artist Don Stephens created a maternal dinosaur scene based on student artist Kelly O'Neill's drawing of a female dinosaur and baby (above, left) (larger photo). 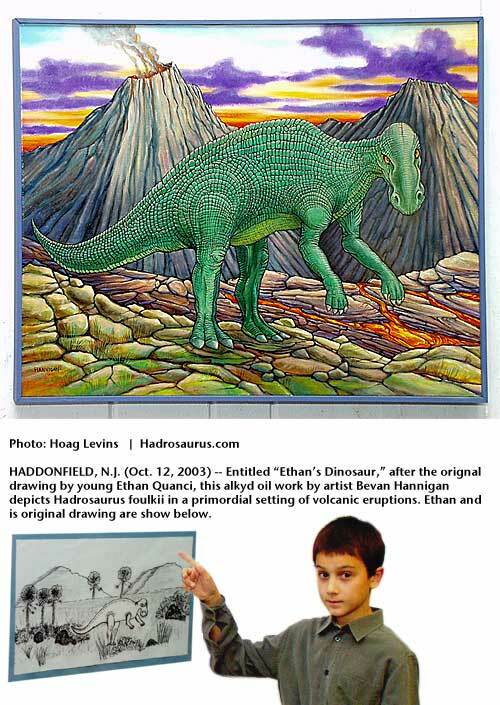 Sculptor and painter Bevan Hannigan depicted a Hadrosaurus foulkii-like creature in a primordial volcanic landscape (above, right). His inspiration was the original drawing by young Ethan Quanci (larger photo). 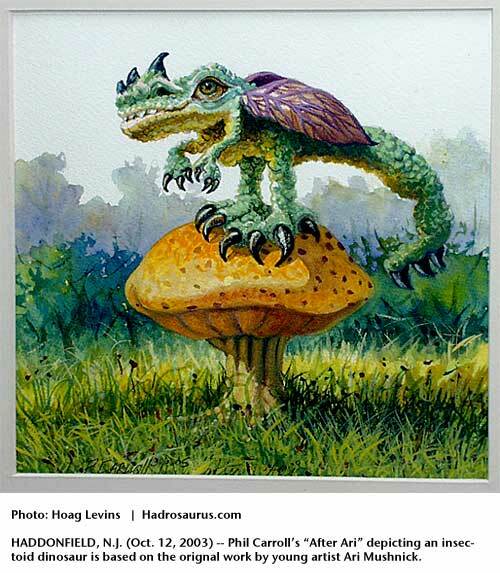 Phil Carroll's "After Ari," depicting an insect-sized dinosaur (above, left), is based on the orignal work by young artist Ari Mushnick (larger photo). 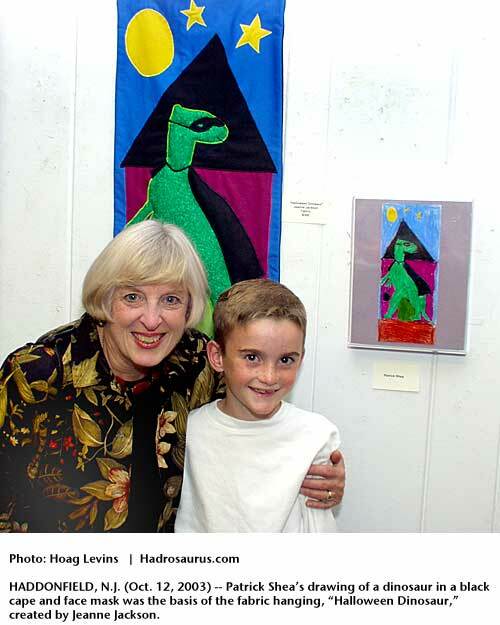 Patrick Shea's drawing of a dinosaur in a black cape and face mask was the basis of the fabric hanging, "Halloween Dinosaur," created by Jeanne Jackson (above, right) (larger photo). 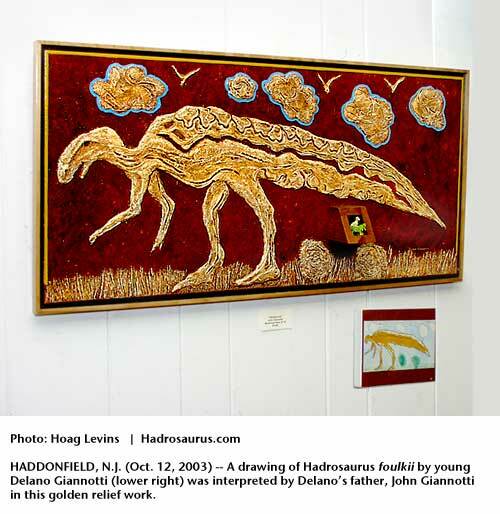 A drawing of Hadrosaurus foulkii by young Delano Giannotti was interpreted by Delano's father, John Giannotti, in this golden relief work (above,left) (larger photo). 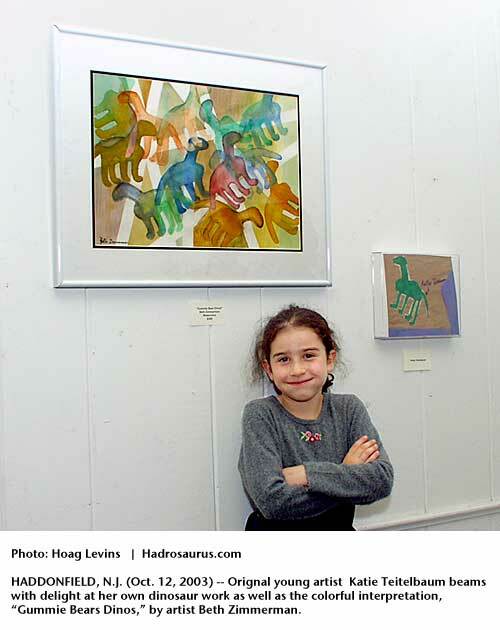 Young artist Katie Teitelbaum beams with delight at her own dinosaur work as well as the colorful interpretation, "Gummie Bears Dinos," by artist Beth Zimmerman. (larger photo).